This article previously featured in The Tribune Weekend section of July 14. FOR those who love books and writing, a wealth of podcasts are out there to let you delve beyond the word written on the page. This week, we look at three shows that take you deeper. 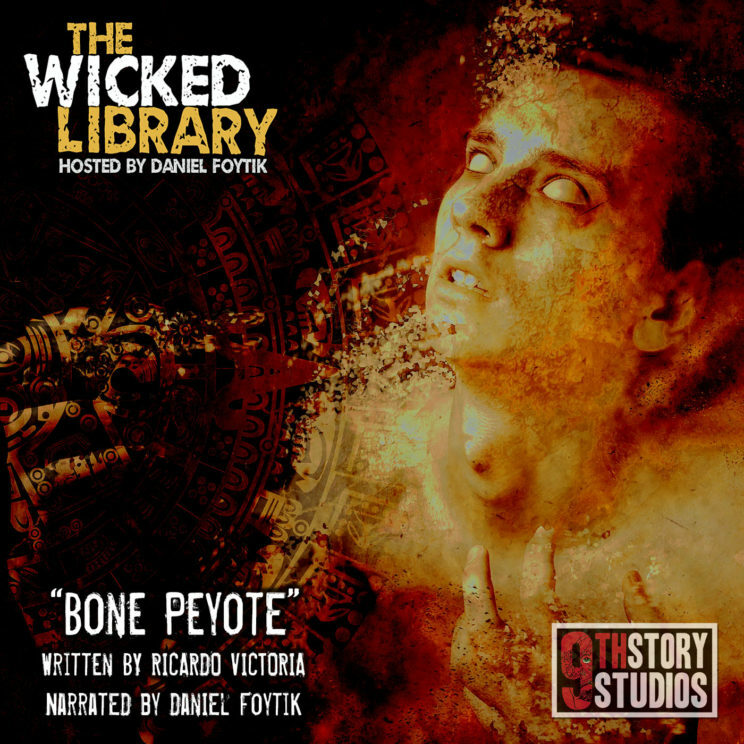 Artwork created by The Wicked Library to accompany the story - part of the classy production values exemplified by the podcast. 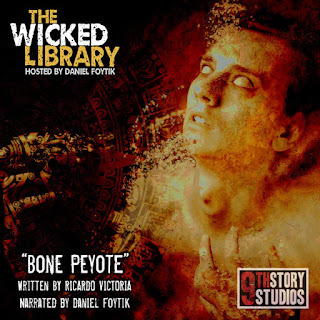 The Wicked Library is a podcast that focuses on horror stories. They take short stories written by authors all over the world and record readings of them. First of all, the quality of the show is fantastic. Fronted by a voiceover from The Librarian – the show's equivalent of the Cryptkeeper from Tales From The Crypt – it sets the tone for a creepy experience, then dives right in with the story chosen for the episode. The latest episode I have to confess a partial interest in – the story is by Ricardo Victoria, a Mexican writer, and I edited the story when it was published in an anthology. But the recording is great to hear. The performance by the voiceover artist is great and really helps the story to burst from the page. It's a Lovecraftian tale of ancient beings, drug hazes and the Mexican Day of the Dead, all wrapped into one, and it's a smashing listen. Beyond that, there's also then a lengthy chat between the host and the author, talking through the inspirations for the story and approaches to writing. It's really like a DVD extra at the end of the show, where you get to peek beneath the hood of the storytelling. Production-wise, it's superbly done, and if you're a fan of horror shows, it really should be in your podcast queue. It's heartily recommended. From horror, we turn to science fiction – with Keystroke Medium, a show that interviews a host of different authors. The latest show features Jack Campbell, the author of the Lost Fleet series, and the chat certainly takes its time and gets in detail on his work and his writing process. Running for an hour, the hosts discuss the books themselves, the possibility of film adaptations of them, the way in which Campbell approaches his writing week, whether he plans out his stories or writes in a more off the cuff manner. By the end, you get a real sense of the author and his work. I'd not encountered his writing before but it's great to get an introduction in such a way to someone new. One of the eternal bugbears with interview shows can be sound quality – you're often stymied by the quality of the Skype call or similar – and that does cause a little hiccup here every now and then, but not so much that it causes a problem with listening. The show came recommended to me in an author group – and you can see why. The hosts really do their homework and love the genre. I'll be back to listen to more! 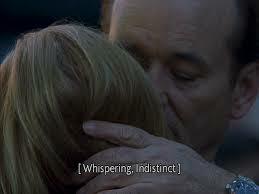 The classic moment in Lost In Translation where the audience is shown - but cannot hear - Bill Murray's character whispering to Scarlett Johansson, a moment spotlighted in The Self-Publishing Podcast. Another highly recommended podcast is the Self-Publishing Podcast – though be advised there's plenty of swearing in here. That's appropriate for the show I listened to – which picked out nine movie moments that writers can learn from, and one of the moments is the first swearword on the big screen. Which movie? That would be Gone With The Wind, and Rhett Butler getting frank with Scarlett O'Hara. It's a neat premise for a show, picking out the parts of a film that are great examples of writing. The analysis varies – the discussion of moments from Up and Inception is a bit soft, but there's a really great look at crucial points in Memento and Lost In Translation and why they have such an impact because of the way the writing leads you up to them. Particularly the look at the unheard whisper in Lost In Translation and the very un-Hollywood nature of that is well done. I will say, it would be nice if the hosts could stay on track a little more – they veer all over the place early in the show before settling down to the discussion. Spoilers, of course, for the movies discussed, so don't dive in if you haven't seen the endings of Memento or High Tension and want to discover them for yourself – but they avoid recent movies. In other episodes, the hosts look at lots of different aspects of the self-publishing industry, so it's quite nice that they vary it up with shows like this, where they focus on elements of the writing itself. And a bonus for blog readers - here's the first episode of the new season of GoIndieNow, from Joe Compton, embedded for ease of viewing. You can find out more about GoIndieNow on their Facebook page here.